uCertify, world’s best online training program that offers a learning path that suits your requirements. The MOS certification 77-422 course here offers hands-on learning. Learn Java with our curated Java tutorial learning paths. Start learning today. We offer LMS integrated MOS certification courses so that you can learn anytime anywhere (on any system) this ensure that all the customers have access to unlimited opportunities to learn anytime and anywhere and that they have the tools that make this possible. 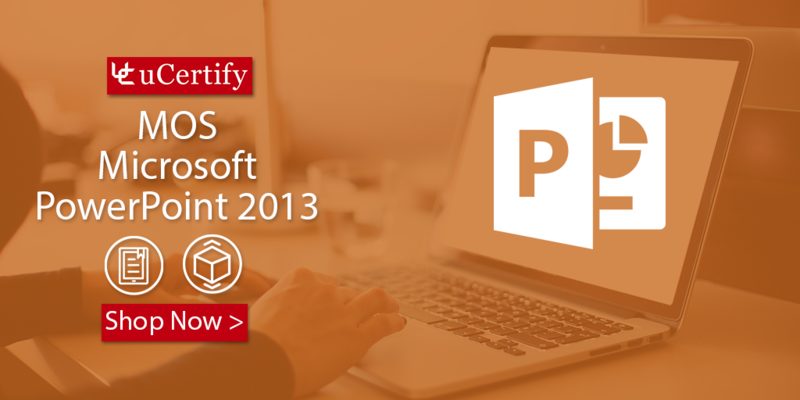 Gain hands-on expertise in Microsoft MOS certification 77-422 exam with MOS: Microsoft PowerPoint 2013 complete course. Performance-based labs simulate real-world, hardware, software & command line interface environments and can be mapped to any text-book, course & training. MOS certification PowerPoint 2013 cert guide provides complete coverage of all the objectives of 77-422 exam and provides skills to create and manage presentations, insert and format shapes and slides, create slide content, apply transitions and animations, and manage multiple presentations. The Microsoft MOS certification PowerPoint 77-422 exam validates your competency across a spectrum of skills needed for proficiency in PowerPoint 2013, managing the PowerPoint environment, creating a slide presentation, working with graphical and multimedia elements, creating charts and tables, applying transitions and animations, collaborating on presentations, preparing presentations for delivery, and delivering presentations. We offer courses for all the MOS certification PowerPoint 77-422 exam, you can try them for best results and excel your career in your dream IT fields. Enroll in the uCertify courses for passing the exams. Posted in IT certification, Microsoft, Microsoft PowerPoint, MOS.